The Abomination of Desolation in Mark 13: What Did the Reader Need to Understand? 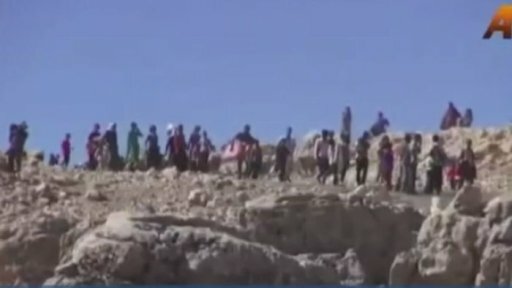 “Today, we know only too well the experiences of refugee treks, what such an escape can look like.” Yazidis of Iraq fleeing to the mountains. When you see ‘the abomination that causes desolation’ standing where it does not belong—let the reader understand—then let those who are in Judea flee to the mountains. Let no one on the housetop go down or enter the house to take anything out. Let no one in the field go back to get their cloak. How dreadful it will be in those days for pregnant women and nursing mothers! Pray that this will not take place in winter, because those will be days of distress unequaled from the beginning, when God created the world, until now—and never to be equaled again. What was that “abomination of desolation”? When we read “let the reader understand” we surely are right to think that it is some sort of mystery to be decoded or explained to us. The following explanation comes from Der Weg Jesu by Ernst Haenchen (1968). Since it is in German I have had to resort to a machine translation. Fortunately, though, Ken Olson on the Biblical Criticism and History Forum set out the main argument to enable me to get started. I recommend reading his post for more detail than I will provide here. To begin with Jesus is addressing an inner circle of his disciples, Peter, Andrew, James and John, “in private”. So it is secret teaching that we are reading. As Jesus was sitting on the Mount of Olives opposite the temple, Peter, James, John and Andrew asked him privately, “Tell us, when will these things happen? And what will be the sign that they are all about to be fulfilled?” Jesus said to them . . . .
For whom is Mark recording this warning? Haenchen pulls us back from immersion in the story and confronts us with the question: Who was “Mark” writing this for? Was he writing a warning for Christians who were caught up in the Jewish war of 66 to 70 CE? If so, what was the point? The warning was recorded too late for them. Further, the warning is for those who “see”, not “hear about”, the abomination of desolation. So was the abomination of desolation something that could be seen by all and sundry “in Judea”, not just in Jerusalem? Common explanations suggest the abomination was something set up by the Roman army in or near the temple in Jerusalem. But if that were the case then what was the point in telling people throughout Judea to run for the hills at that point? If the Romans were already inside Jerusalem then they had already swept through Judea. Why wait to run until after the enemy has occupied your homeland? Haenchen’s solution resolves such problems. Compare the prophecies in the Book of Revelation. Symbolic language is used, arguably to protect those who treasure the writing. It is proposed that explicitly anticipating the fall of Rome was not something to shout out about so Babylon was substituted for Rome. Those “in the know” knew the coded language. The Book of Revelation also speaks in its thirteenth chapter of a terrifying moment when God’s chosen would face an image of a beast and be ordered to worship it or be killed. What situation in these early days of Christianity, in the days when the Gospel of Mark and the Book of Revelation were being written, would arouse such fear that the only way out was to drop everything and run immediately into the wilderness and hide in the hills? The answer: the visit to one’s town of an imperial official setting up an altar and calling on all inhabitants to sacrifice to the emperor. Penalty for refusal was death. The mere possibility of such a moment was enough to generate fear. Mark was not writing a warning for the people of Judea long after any danger facing them had passed. The war was over. What he was doing was couching (or coding) a warning to his readers in Italy, Syria, anywhere throughout the Roman empire, in the language of Daniel the prophet.